It seems to be that a lot of my favorite restaurants in Vegas converge around the Bellagio Fountain. I don’t see why not. The Fountain alone is amazing to have as a background of a great meal. 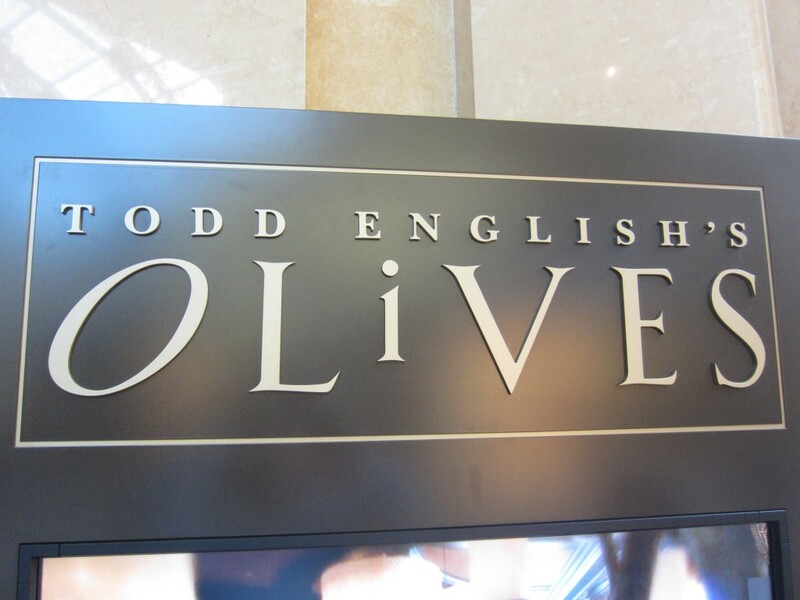 Todd English’s Olives in Bellagio has class and taste, and won’t hurt your wallet. From the interior design, to the food on the plate, everything was balanced and cohesive — it all felt like they belonged. 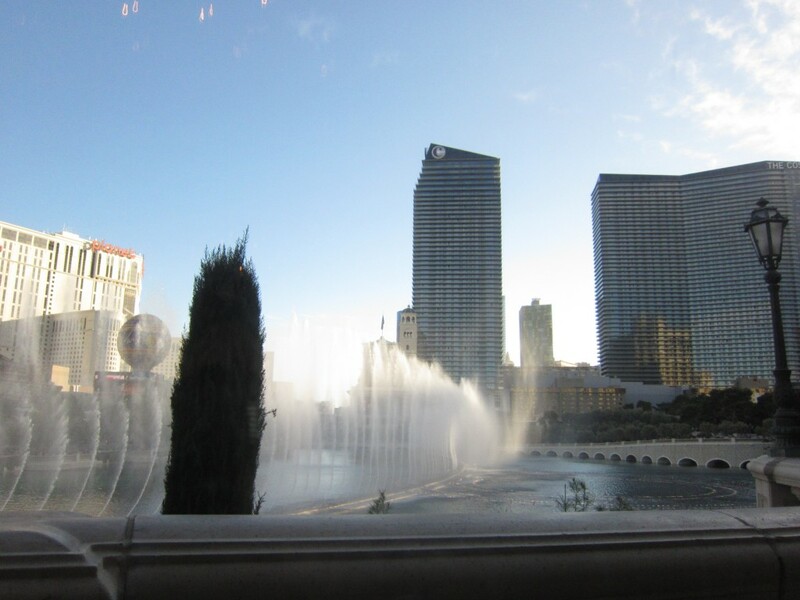 Upon making reservations, I was happy to be seated next to the window facing the fountains. I asked for the tables outside, but there were none available. In hind sight, eating inside was a better decision. It was warmer, the decor was nice, and I still sat directly next to the fountain. Complimentary bread and olives (how fitting) was given before our meal. The bread varied from chiabata and flat breads, and eating it with the olives was tasty. It was a bit salty, probably because I used too much, but the taste was very clean and pure. It isn’t your normal bread and butter — that’s a good thing. To go along with our bread, we opted for the Beef carpaccio to compliment our appetizer. Yes, beef carpaccio is raw beef. Never having it before, and knowing they are known for this dish, I was excited. The beef was fresh and of high quality, as it should be. The polenta and gagonzola, and scallion cream gave it a nice creamy texture. My favorite was the balsamic reduction. It was sweet and acidic, which helped break up the richness of the beef. The parmesan, cipolini onions, and garlic aioli rounded out the flavors nicely. It was a great first experience. Of course, I love prosciutto. Salted cured meats? Fatty and buttery deliciousness? I am there! 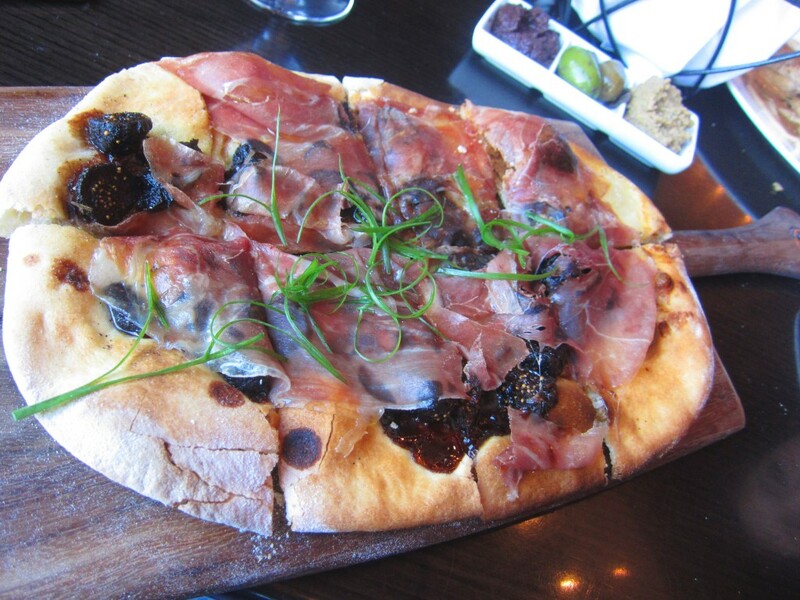 Their Fig and Prosciutto flat bread is a must order for sweet and salty lovers. The fig jam was a bit sweet for me and overpowered the Gorgonzola. Gorgonzola is a pretty salty and strong cheese — the rosemary crust and the prosciutto di parma was savory. Maybe a bit more prosciutto, and a bit less figs would have made this perfect. The butternut squash tortelli was a great dish as well. The filling was a mixture of amereto cookie and butternut squash. A bit sweet, but I guess that is the theme of the meal. 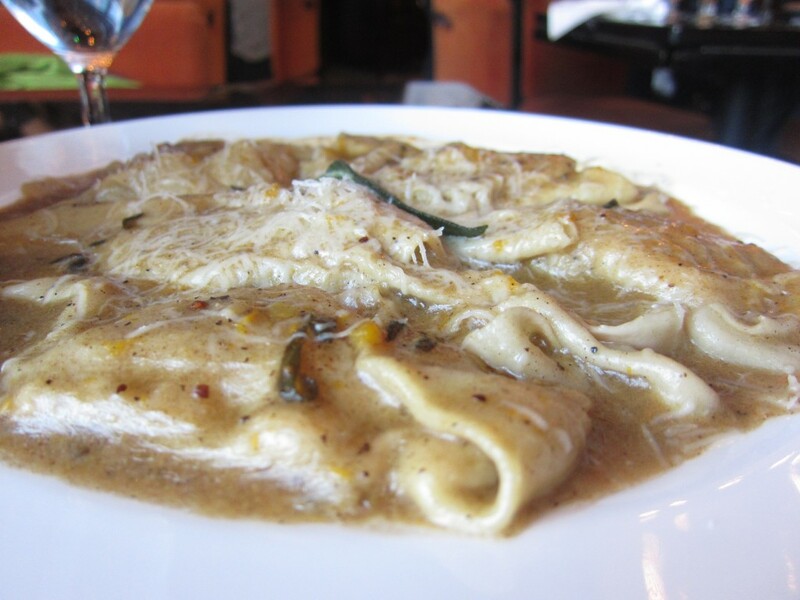 The sage and brown butter, with parmasan cheese made a sweet yet savory sauce. It was a perfect balance of sweet and savory. 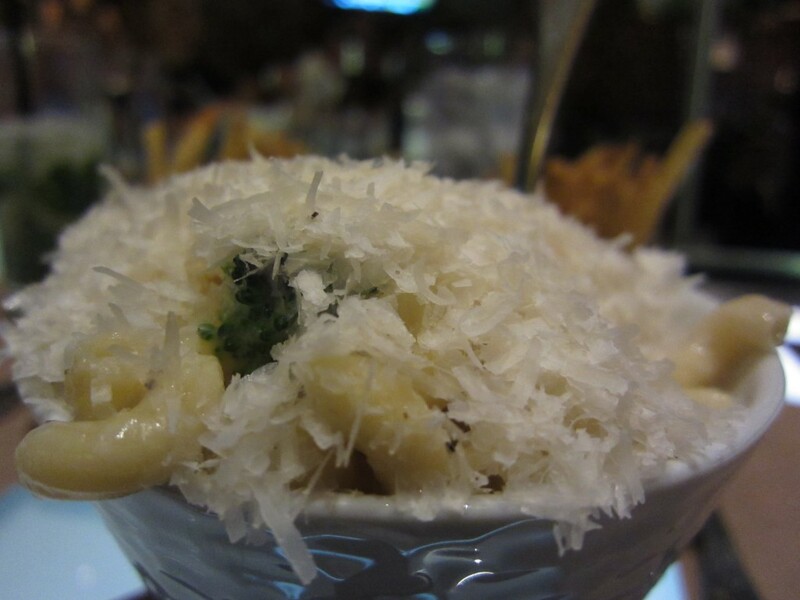 The outer layer pasta was freshly made and perfectly cooked. This was one of their signature dishes as well. 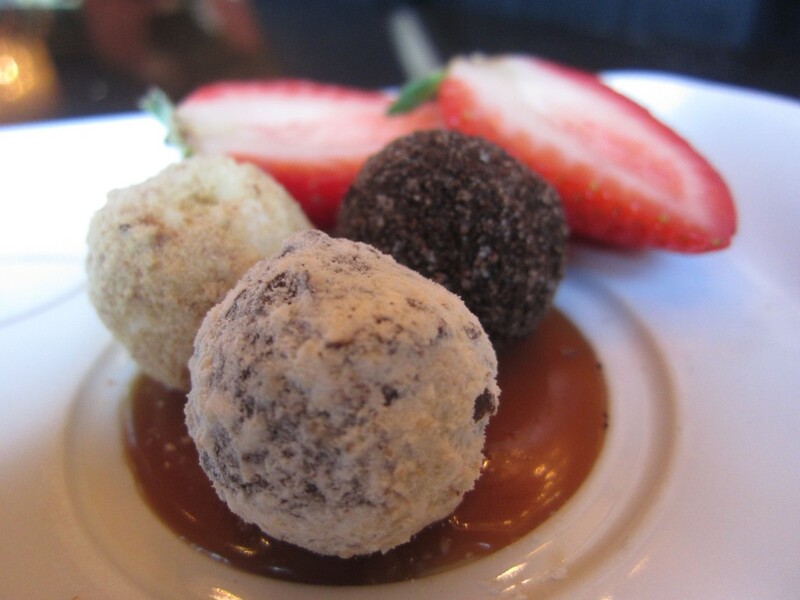 For dessert, we got the truffles. It came in a trio on top of some of the best caramel I have ever had. One truffle in particular had a dark chocolate, coffee filling that was so rich in flavor. It was a perfect truffle. Eating all this good food, watching the fountain show, and enjoying it in the comforts of Todd English’s Olives was a pleasure. Yes, the food had a theme of sweet and savory going on, and we did risk the dangers of eating raw beef, but it was all worth it. All that goodness, and to top it with complimentary dessert truffles was a display of exceptional service. Things like this make me happy. Good food with good people in a restaurant with great food. What more can I ask for? Mandalay Bay has some of my favorite things. 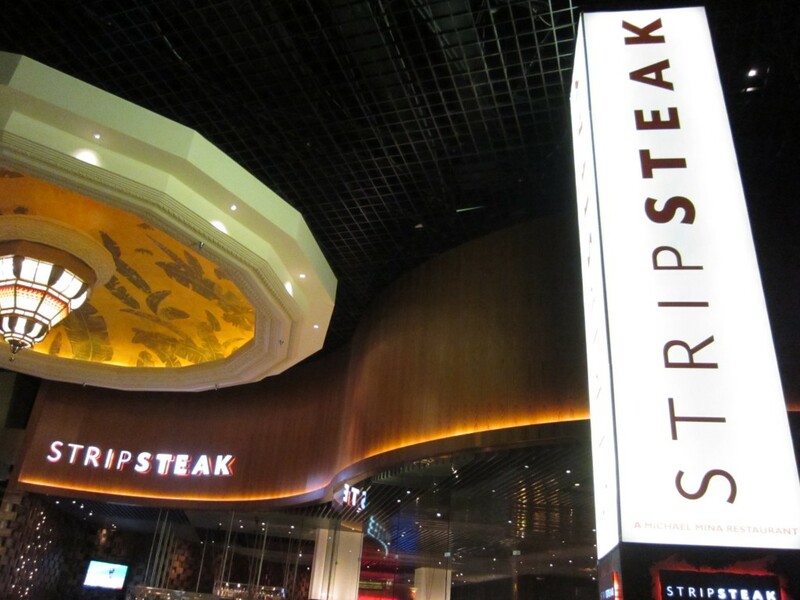 It is away from the busy party hardy vibe from the center strip, it has one of the best pools in Vegas, and it has Stripsteak. From the outside, it just looks and give off a normal steakhouse feel. Once you dine there, you are treated so importantly — you are taken care of. You know the caliber of a restaurant by the water. If the ice is foggy and the water tastes like tap, most likely, the food won’t be good. What amazed me at Stripsteak was that the water they served is bottled Fuji water. It was that good artesian water, and quite honestly, the best tasting water of all time. For them to take the time and money to serve good water to the customers really impressed me. I knew from there on out, the food would be amazing. The bartender was helpful in picking a drink for us. In our indecisiveness, he made us a pineapple mojito. It was good and special custom made drink. Sadly, we did not get to try a full on steak here. We were here for a late night snack and drinks, and this was perfect beyond words. Thinking a table would be a bit much, we ditched our reservations and just sat casually at the bar. The vibe was very relaxing — No nose in the air kind of attitude here. I asked the bartender. 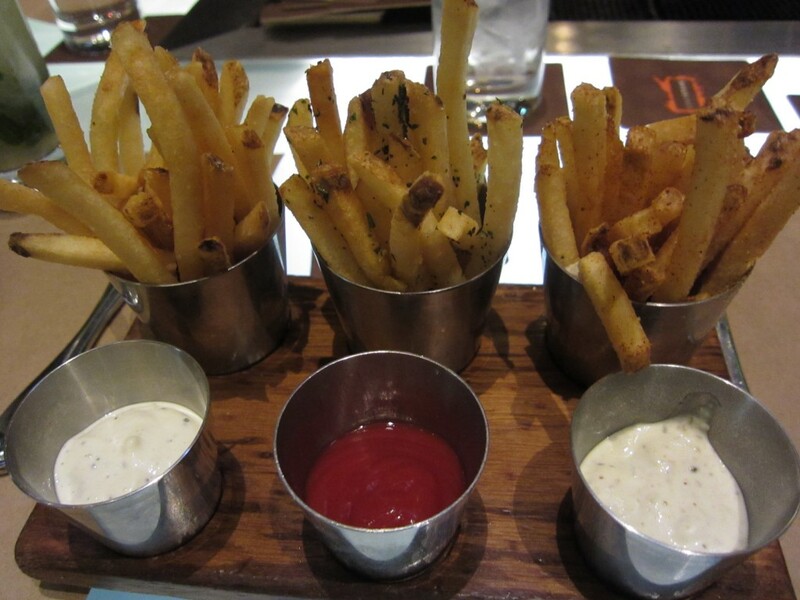 “Can we order the truffle fries trio? I do not see it on the menu.” He responded with, “Oh, those are complimentary, on the house with every order.” For a restaurant to give complimentary fries was amazing to me. It wasn’t the boring bread and butter here. And it wasn’t just ordinary french fries either. These were duck fat fries, done three ways with three dipping sauces — truffle fries, garlic herb fries, and cajun bay seasoning. I will say this — These were the best fries I ever had in my life. The duck fat made it very rich and flavorful. The truffle fries were amazing. 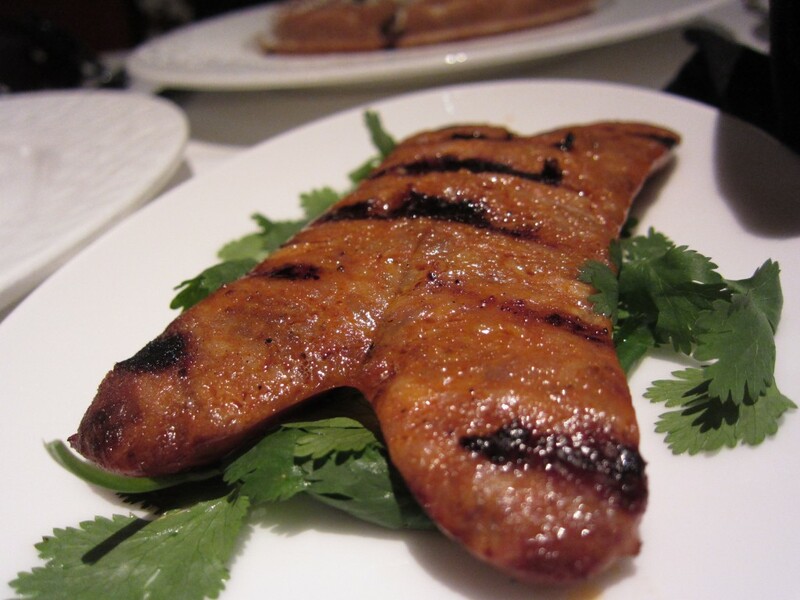 It had a light crisp texture, with a meaty and buttery depth. The cajun and garlic herb fries were good as well, especially with the truffle aoli, house made ketchup, and cajun sauce. I will definitely eat these every time I go to Vegas. All for free, and amazing. We just ordered the truffle mac and cheese. It was alright. It could have been more cheesy and less watery. The taste was there, but I just wanted it gooey and cheesy. The truffle flavor was there, something I don’t get to have a lot. 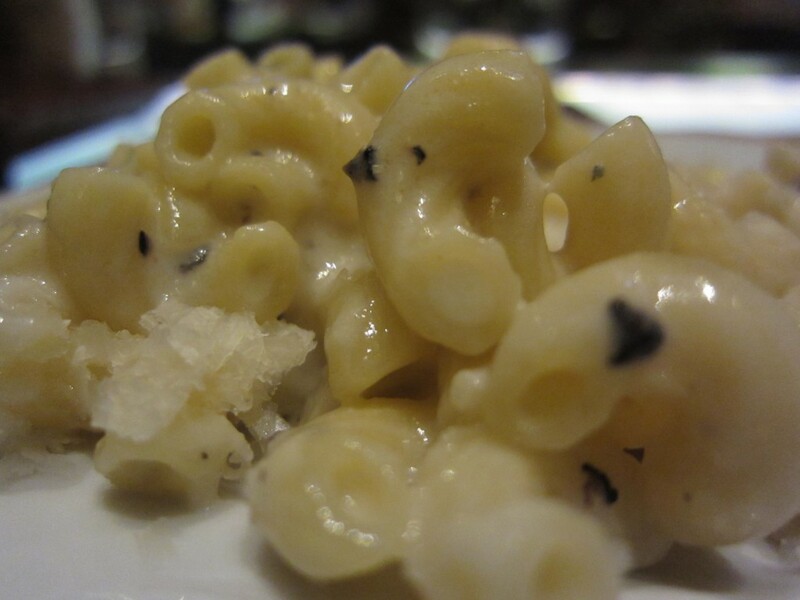 It was buttery, somewhat cheesy, and definitely truffled. The broccoli inside was a nice touch, and it was especially delicious with the fries. All in all, it was a great meal and snack. Our mouths were open to the rib eye the guy next to us was enjoying. Next time, after a good run on the craps tables, I will have my rib eye. A birthday dinner has to consist of two things: good food and good company. Luckily, I had both. I had some amazing food that I would never eat on a daily basis, and my favorite person next to me, who treated me out for my birthday. A birthday doesn’t get any better now does it. 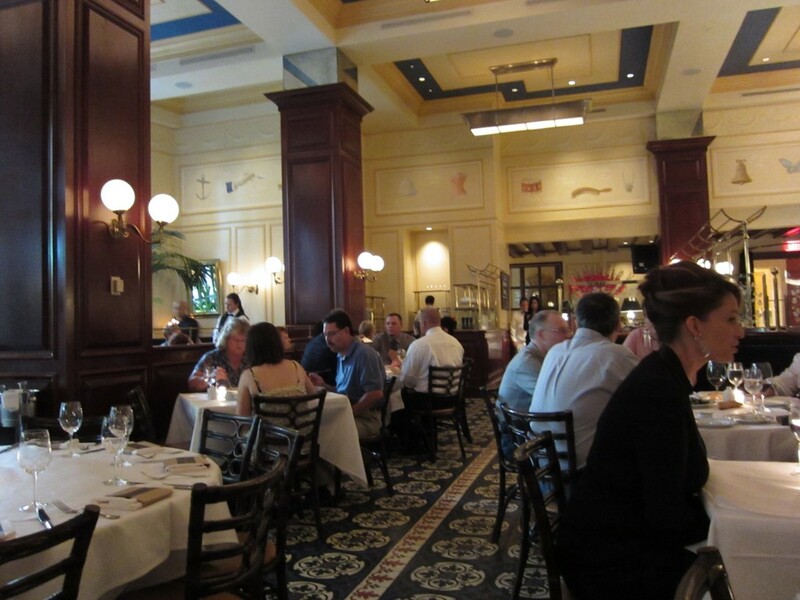 Located at Venetian, Bouchon has a sense of class and ambiance that is so pleasant. 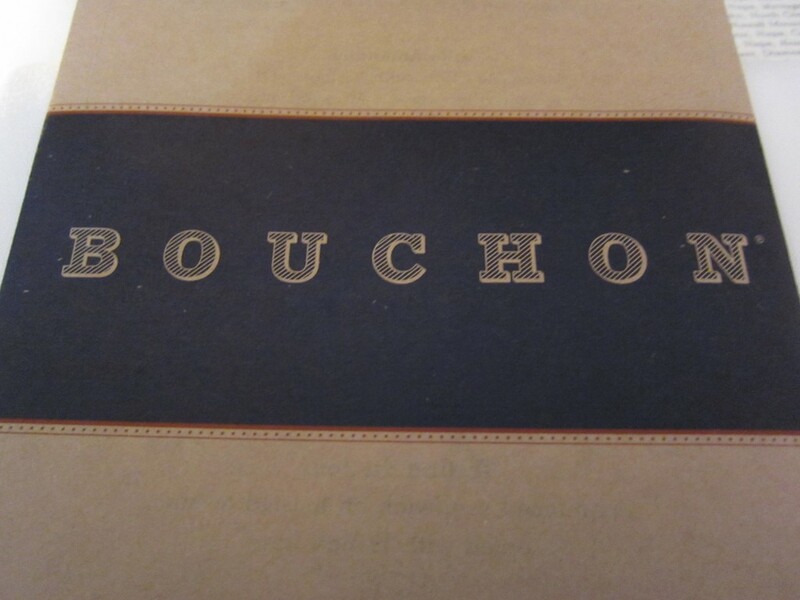 This place is located on the “Bouchon” floor. Pretty cool. Once you walk in, you notice the decor isn’t really chic or modern, but has more of a relaxed European (French?) feel to it. Nobody does French better than Thomas Keller. He is world renowned and is quite possibly the best chef in the world. I dream of eating at the French Laundry before I die. Though this isn’t his actual restaurant, until then, Bouchon will have to do. So the birthday boy, me, wanted some meat. I ordered the steak frites, minus the frites. 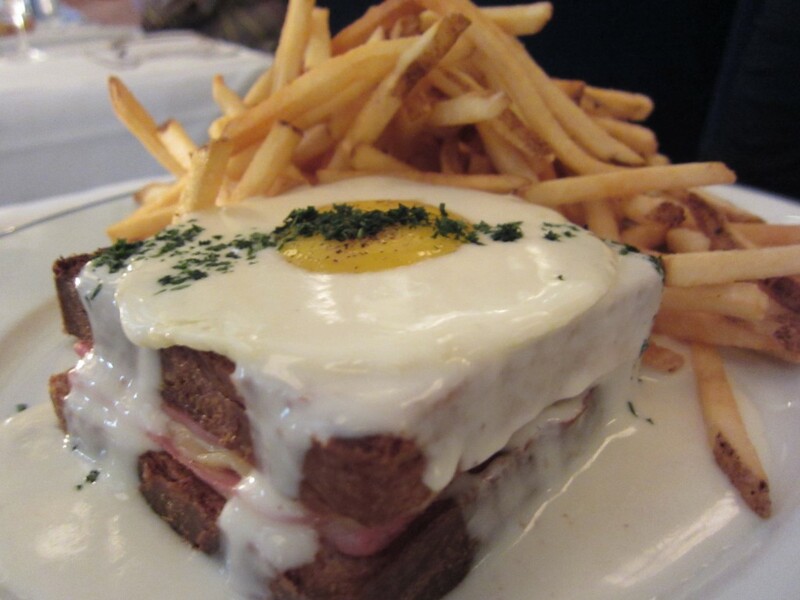 My girlfriend ordered the Croque Madame, which comes with fries already. I switched out my fries with their mac n cheese. No harm in having a big boy steak and a kid like mac n cheese. My steak was a pan seared prime flatiron, the cut of a cow right near the neck. This meant that it had a beefy and livery flavor, but in a gentle way. There was no sign of caramelizeation of the meat, which was weird to me. 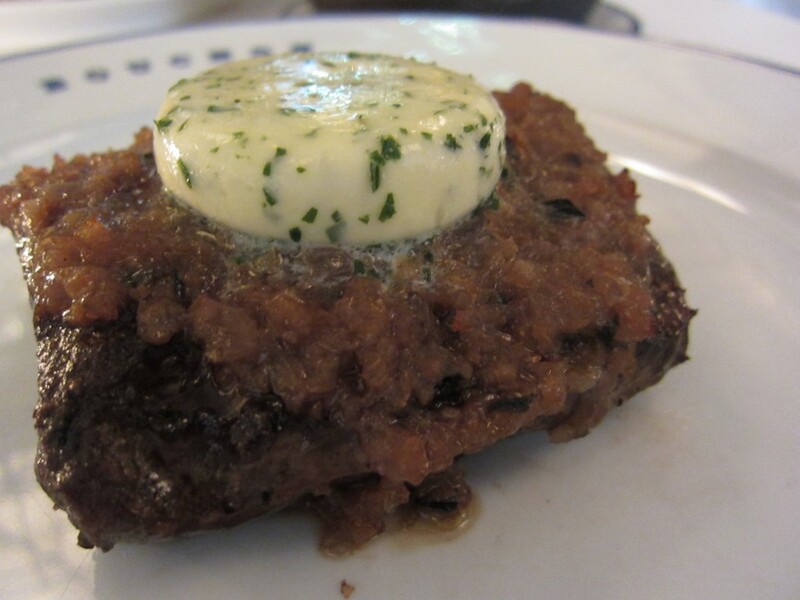 Maybe the maître d’hôtel butter and caramelized onions covered up all the sear. The taste of the beef was like no other. It had a grainy beef flavor — it was strong, but it was good. The flavor was just plain unique, in a good way. Cooked to a perfect medium rare, each bite was juicy and delicious. 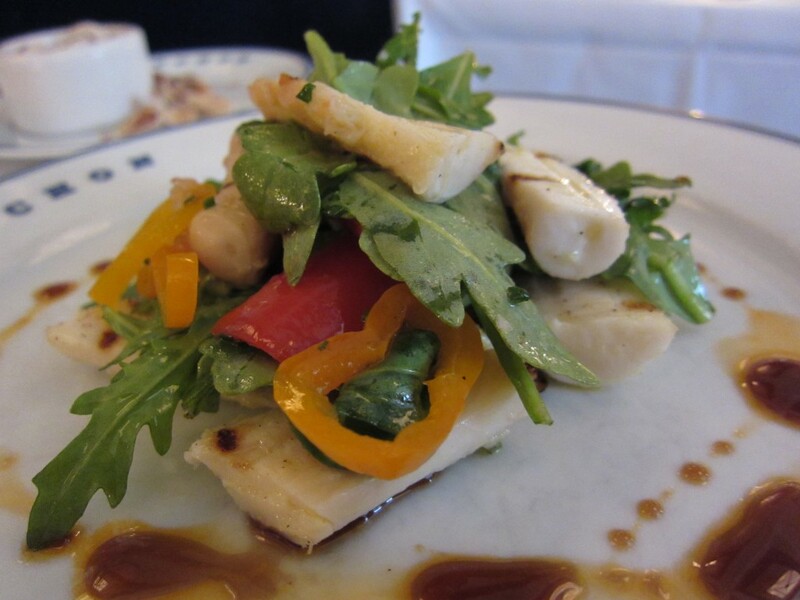 Before this amazingness, we shares a grilled octopus salad. This was the best octopus dish I have ever had. Not only was the octopus tasty wit the lemon vinegarette dressing, it wasn’t chewy. I was surprised that the octopus wasn’t chewy. They achieved this by taking the skin off before they cook it. The soft octopus meat and the tasty salad was such a good mix. This was fine dining at its finest. My girlfriend’s Croque Madame was actually more tasty to me. It was basically a ham sandwich made into an open faced sandwich. It had toasted ham and cheese on top of a brioche slice. On top stood a fried egg and mornay sauce. And remember, there was a side of french fries. The sweetness of the brioche played nice with the ham. 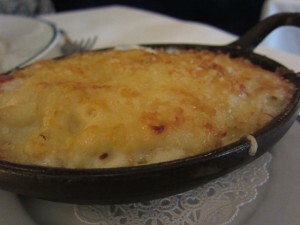 The mornay sauce was very rich and creamy. 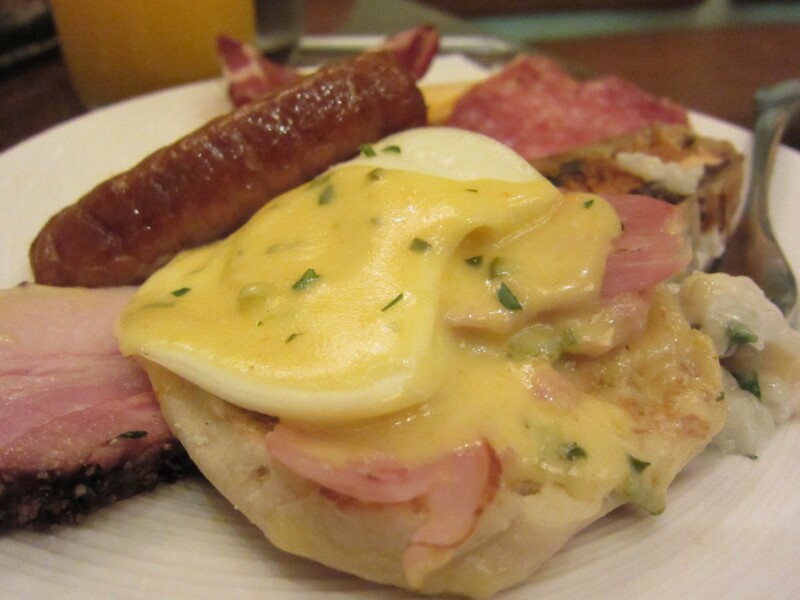 It tasted like a mix between a hollandaise and a cheesy cream sauce. The dish was very tasty, and I would order this again if I ever had a chance to dine here a second time. A birthday dinner is nothing without a good dessert. 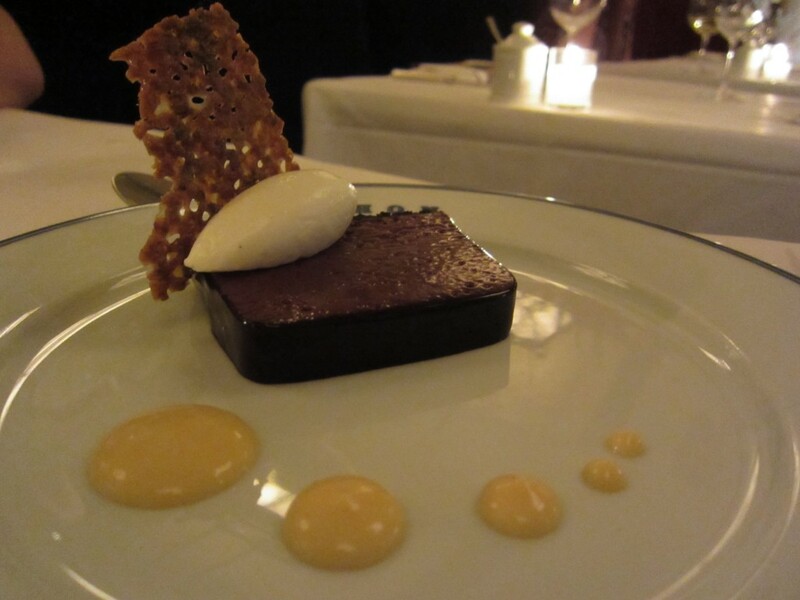 The Marquise au Chocolat was a perfect ending. The dark chocolate mousse was very strong and not too sweet. I am a dark chocolate enthusiast and this really hit the spot. The burnt orange cream was a nice touch to the dessert as well. I am not really a fan of chocolate and citrus fruits, but this one worked well somehow. It’s not a birthday cake, but this definitely will do. What an amazing birthday dinner this was. Not only was I at Vegas, I was doing Vegas right. Eating at the right places makes all the difference. Vegas and fine dining just go together. 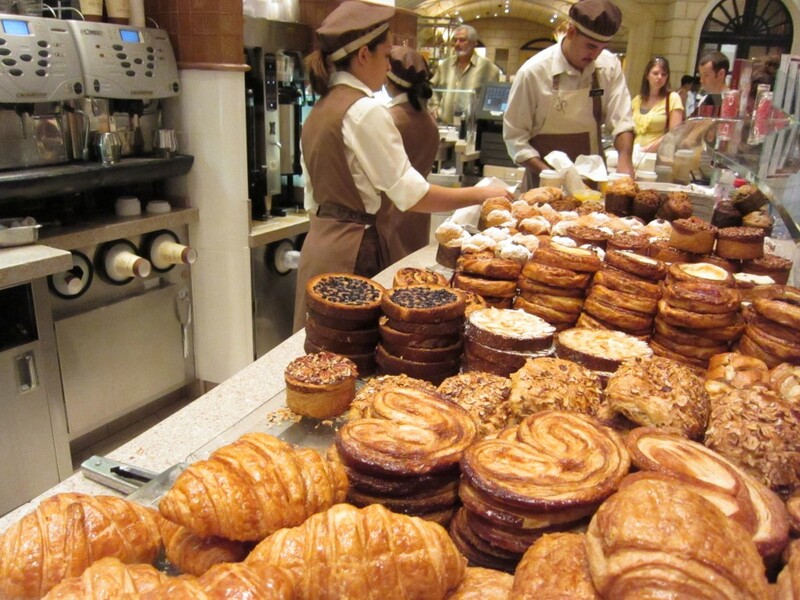 Bouchon is one of the best fine dining spots in Vegas, and The Venetian is a premiere casino and hotel. Off the see the Blue Man Group after an amazing dinner here, and you can call it a night. You are in Vegas. It is late, and you don’t quite want to call it a night. A light night snack is in order. Where do I decide to go? Aria. I never seen City Center, and I wanted a cold drink and dessert. I decided to go to Cafe Vettro to kill two birds with one stone. The interior was kind of interesting. 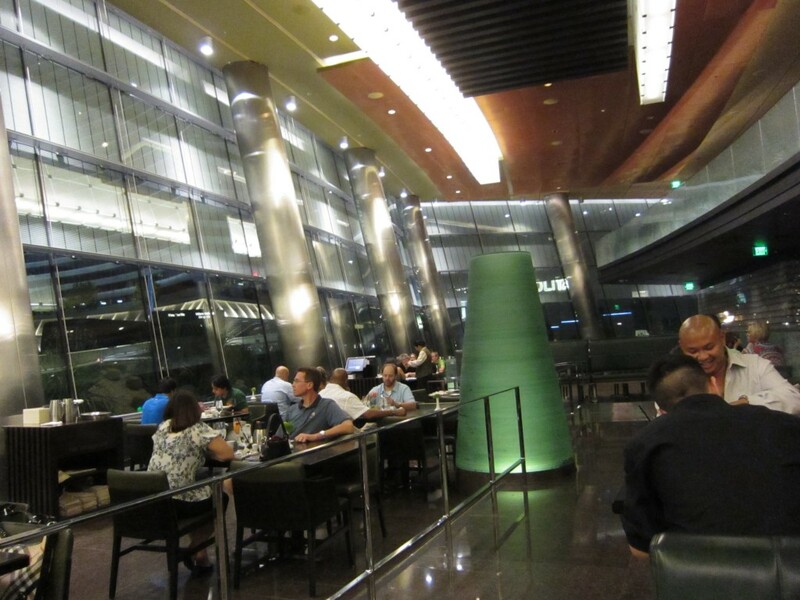 The rocks and the futuristic pillars randomly scattered throughout the dining area was kind of a cool contrast. The large panoramic windows and high ceiling were very attractive. There was loud music playing from the club that was supposedly underneath the restaurant. The cool atmosphere really didn’t do it for me, because well, the food and service was not at par with the decor. We ordered a drink and a chocolate soufflé with vanilla ice cream. This was good, but not great. I wasn’t expecting much, I was half dead, and this wasn’t really a knock out. The chocolate wasn’t chocolatey enough, and the ice cream tasted like cold tasteless cream. Like I said, I wasn’t expecting much. Don’t be fooled by the newness of Aria. Yeah the actual hotel and casino is really nice and is a great addition to Vegas. 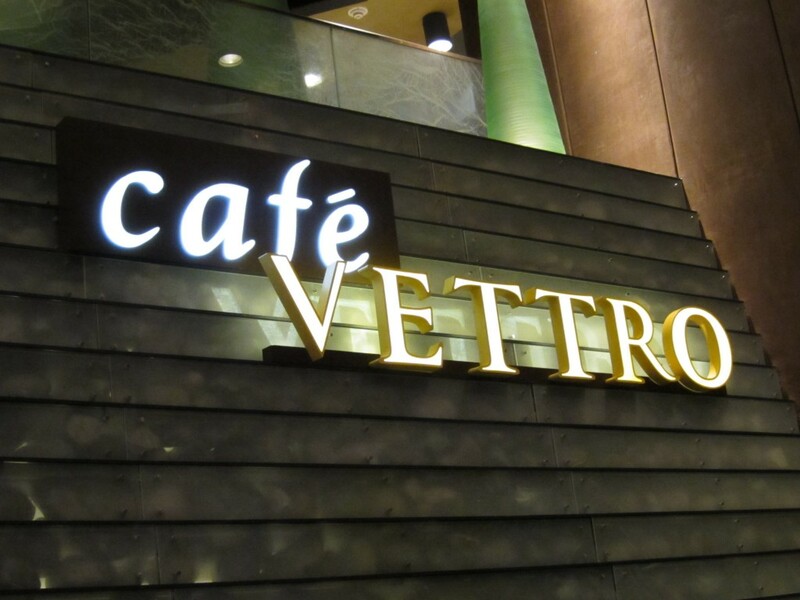 I would recommend to stay away from Cafe Vettro. It isn’t good nor is it special. One should go elsewhere for a late night snack. City Center, 1. Aria, 1. Cafe Vettro, 0. There is nothing greater than stuffing your face with everything and anything for 40 bucks. I mean, that is what Vegas is all about right? 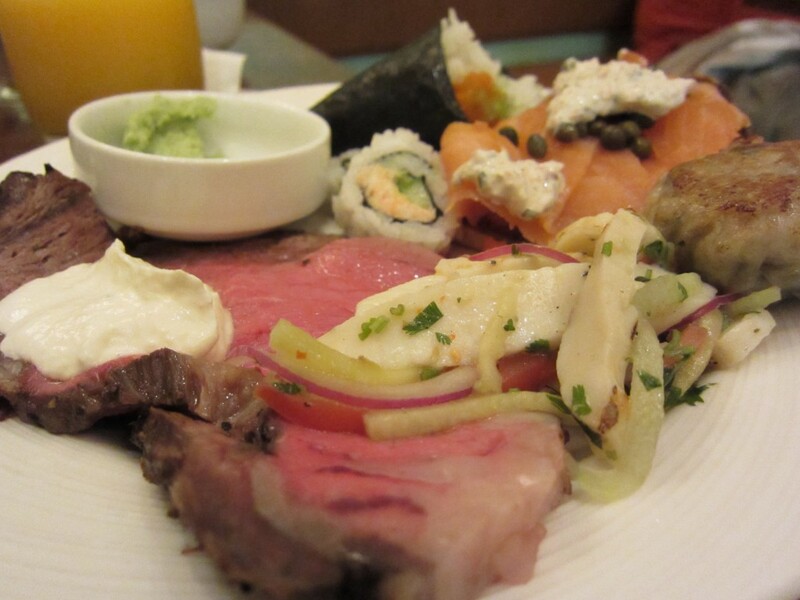 Prime rib here, some macaroni here, sushi and sashimi here. Anything you want, you got it. 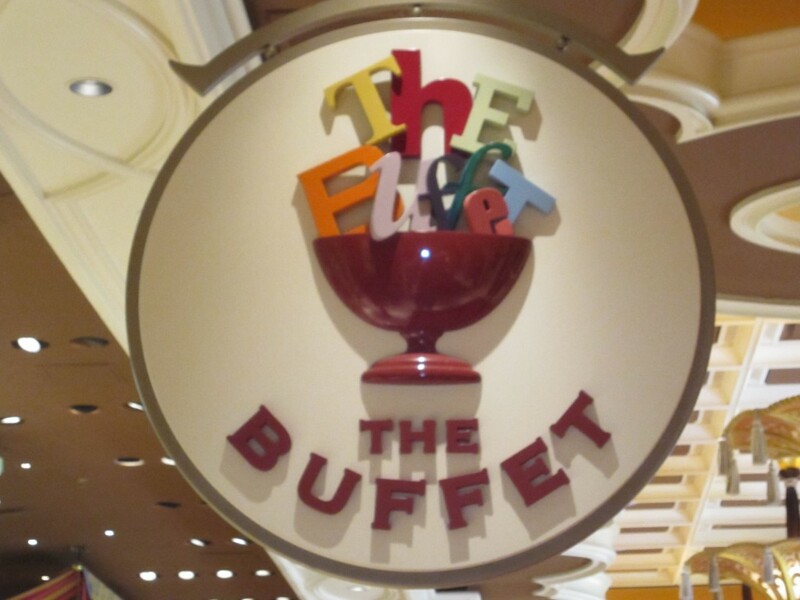 I know everyone has their favorite buffet at Las Vegas. 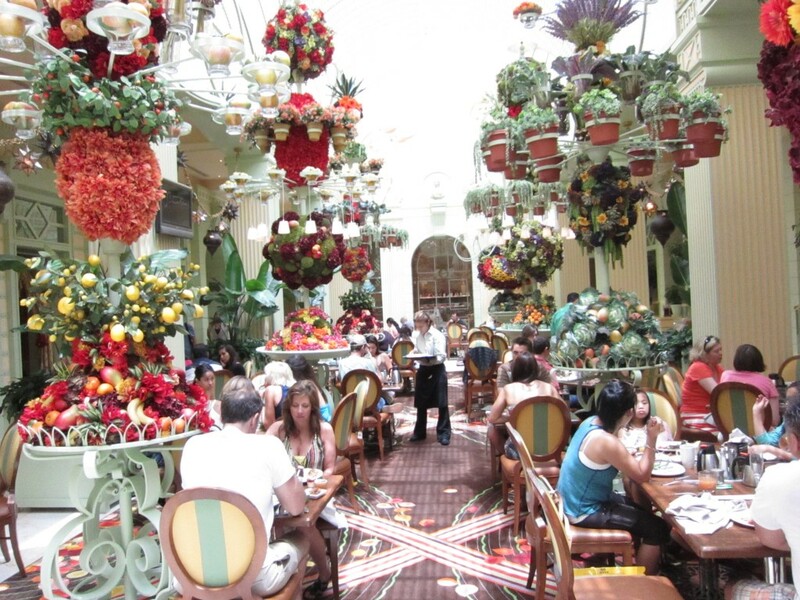 Some are die hard Bellagio Buffet fans, and some go for the biggest one which is at Rio. Though the Wynn buffet isn’t my most favorite, it is the nicest. The decor here is really nice. The main dining area is actually really attractive, with bright sunlight coming in and exotic looking trees and plants. The fun stops there, because once you enter the external dining area, it is just plain and normal. Though they do kind of trick you, the main kitchen area is really bright and inviting. The food was just average — I mean, it’s a buffet. Never have I went to a buffet and said to myself, “Wow, this is the best _____ I ever had.” Some may have come close, but never the best. 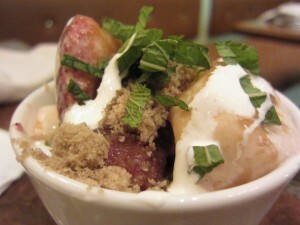 My favorites here were the squash risoto, strawberry and banana creme fraiche, and the desserts. I was sad to find out that they did not serve crab legs for brunch. I usually make my money’s worth with crab legs, but this time, I felt I came out on bottom. 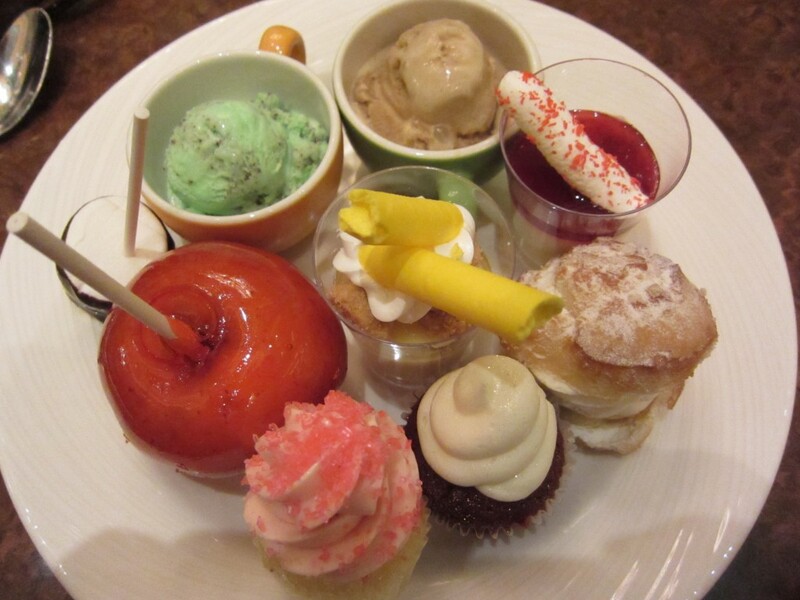 Of all the buffets in Vegas, Wynn has the best dessert selection — of course second to Wicked Spoon. My favorites were the tiny colored cups of gelato and cakes. One of the best of the desserts were the cupcakes. They were so simple and so small, but the cupcakes were so delicious. I don’t know if it was the sweet frosting or the edible glitter, but these cupcakes were amazing. Vegas wouldn’t be Vegas without a day of face stuffing. Gluttony is the reason they call Vegas Sin City, right? 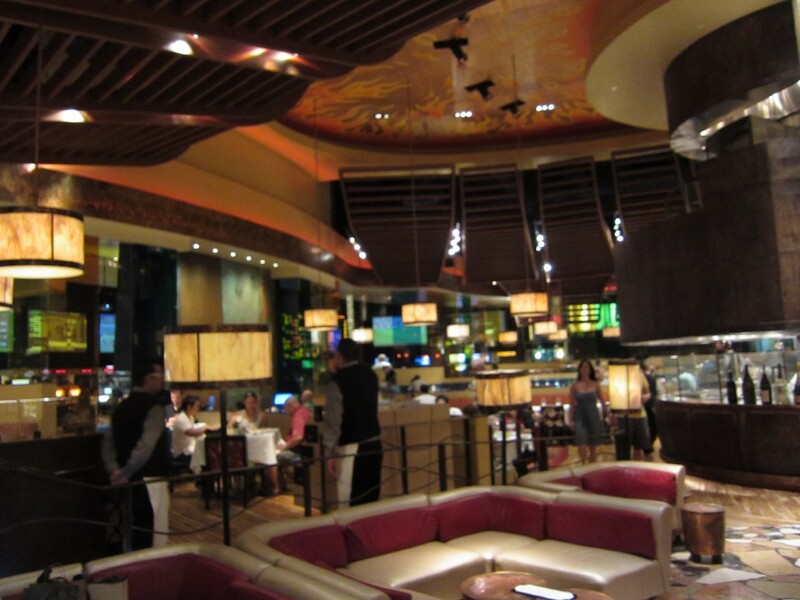 The Buffet at Wynn has a good selection of food, and the inside is inviting. Just remember, if you want your money’s worth, go for dinner. And eat extra crab legs for my sake. Sometimes you enter a place, and you are instantly happy. The colors and the decor just pop and makes you somewhat feel like a kid again. This feeling I am talking about is the feeling you get walking into Disneyland or in my case, Walking into Jean-Philippe Pâtisserie. Visually this place is stunning. The mellow pastel colors just make you melt as you walk in. It is almost like walking into a fantasy cartoon land. 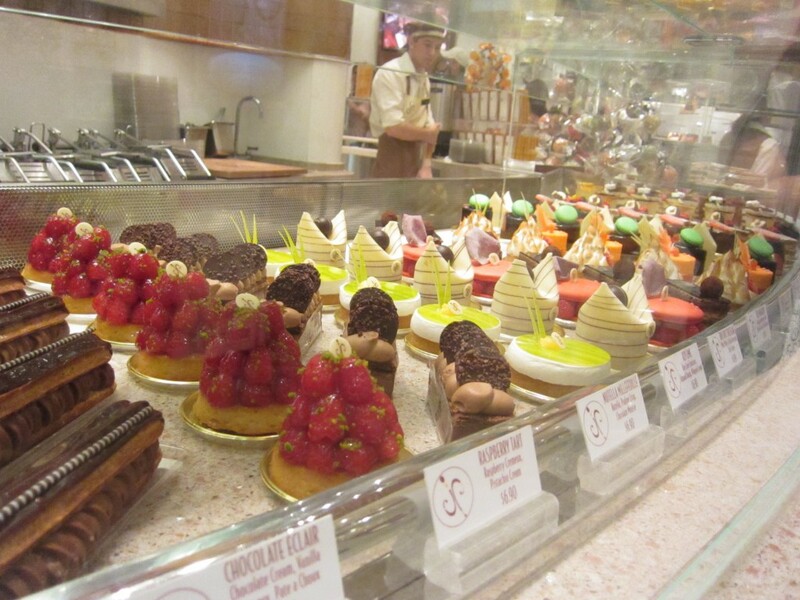 All the treats and desserts displayed behind the window just makes you want to eat them all. The most fascinating thing is the chocolate fountain. Not only is this a grand fountain of sweet melted goodness, it is record breaking. 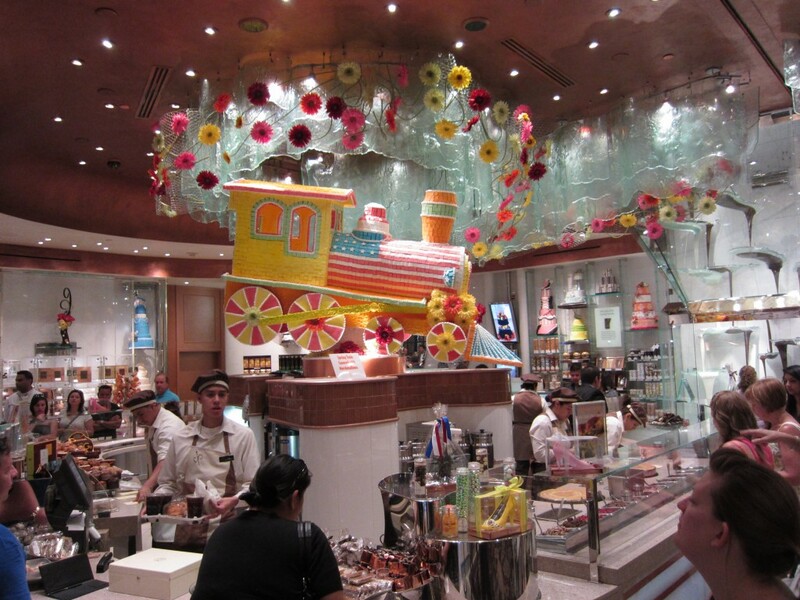 It is the largest chocolate fountain in the world, circulating 2 tons of chocolate! Interesting to know that the largest chocolate fountain in the world is a the Bellagio in Las Vegas. Check out the short video to see it all in action. The decor and design is amazing, how are the pastries? The selection they had was too much, not a bad thing. I wanted to try them all, but only stuck with 5 things: dulce de leche brioche, nutella brioche, cheese danish, chocolate macaroons, and banana muffin. My favorite were the brioche. Inside was a gushing amount of dulce de leche or nutella — almost too much. By far, the nutella was better than the dulce de leche. I was sad that they did not serve the gelato in the morning. I just got some pastries for the road before checkout. 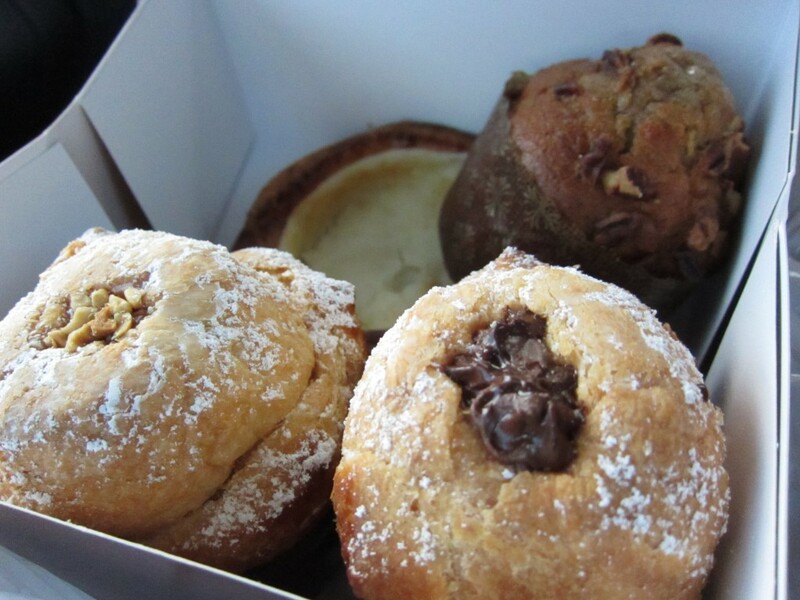 These pastries made the drive back to Los Angeles a little better. AC on my face, taking a little bite of everything as I drove back home. The cool thing is, you can get a lot, and just stash them at your place back home. 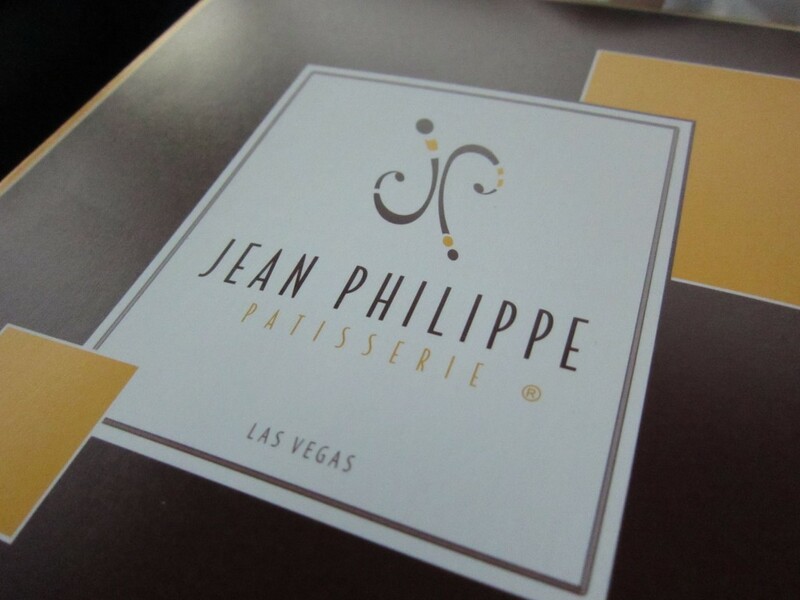 Every pastry is a memory of Vegas. 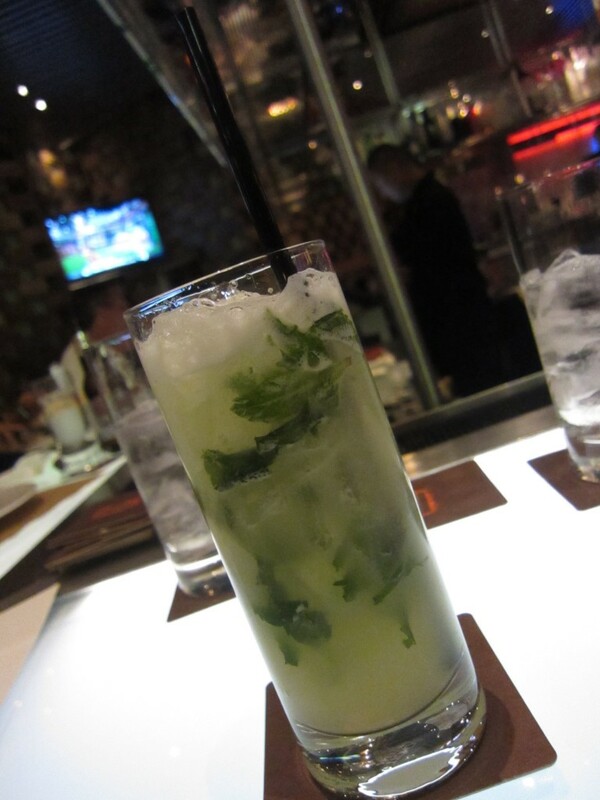 An avid fan of all things Food Network, and a personal fan of Bobby Flay, it was a special time at Mesa Grill. My girlfriend took me here for lunch on my birthday and it was special. I don’t know if I ever ate at a famous chef’s restaurant before. Located at Caesars Palace, the walk from our hotel at the Bellagio was a bit of a drag — the Vegas heat was not kind. The decor and furniture in the whole restaurant was amazing. 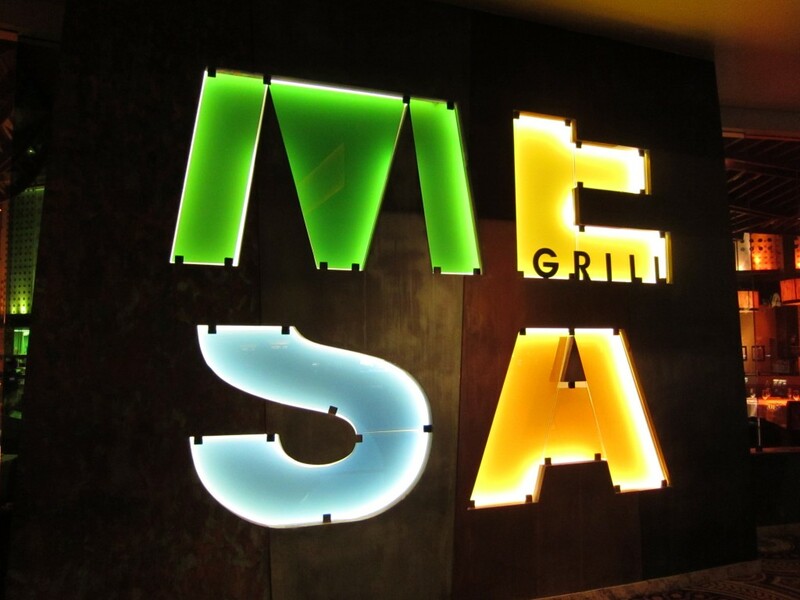 It seems like everything in Vegas has be to decorated so perfectly, and Mesa Grill was no exception. Cow hide lined chars, dark wood table tops, and an open kitchen, was just a few of the accents this restaurant had. We were given some bread to eat before our meal. This was the best array of breads we ever had at a restaurant. Most places give the normal sourdough or french bread and butter. Don’t get me wrong, that is great stuff. 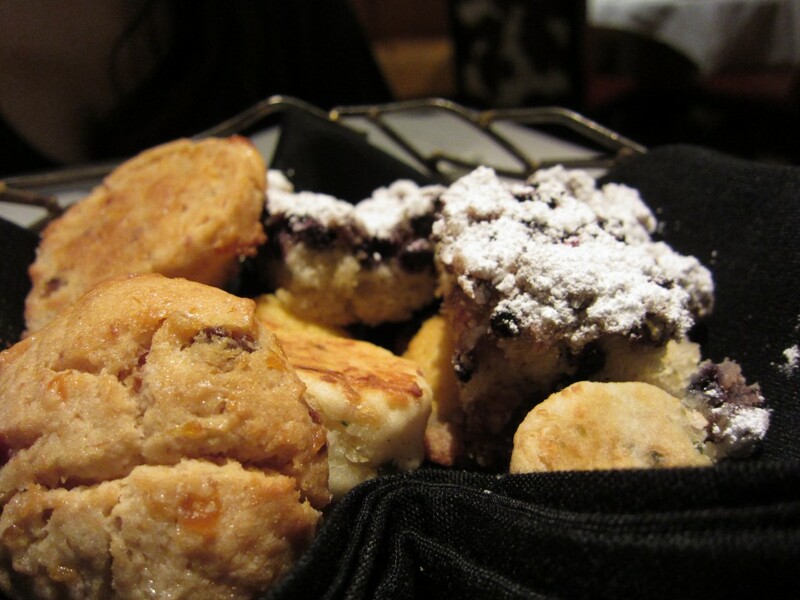 But at Mesa Grill, they gave some jalapeno bread, corn bread, and muffins. Not only was it a variety, all of them were really good. My favorite was the jalapeno bread — it just woke up my taste buds. For our start, we had the tiger shrimp tamale. 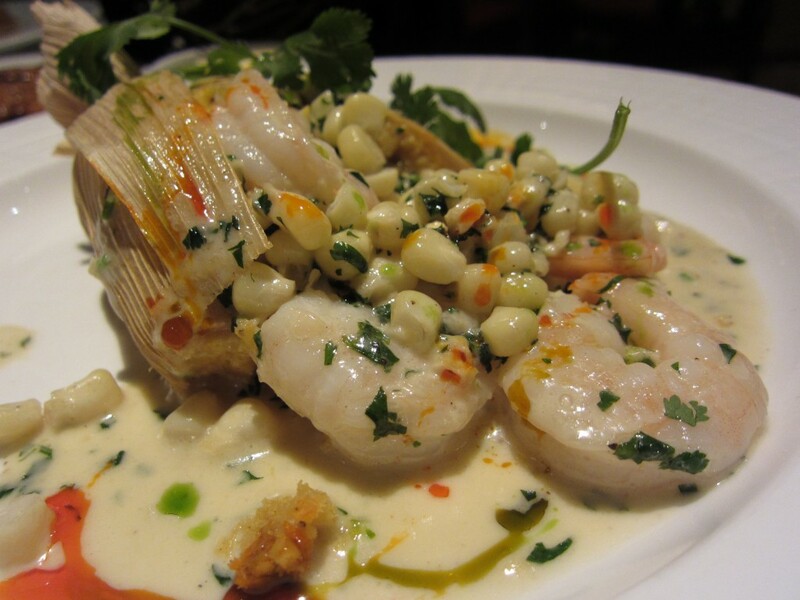 It had roasted garlic and tamale sauce with bits of corn on top to form a creamy sauce. The shrimp inside was amazingly seasoned, and the masa was perfectly fluffy and moist, something I don’t see a lot in other tamales. I didn’t get the garlic flavor a lot, but this tamale was tasty either way. 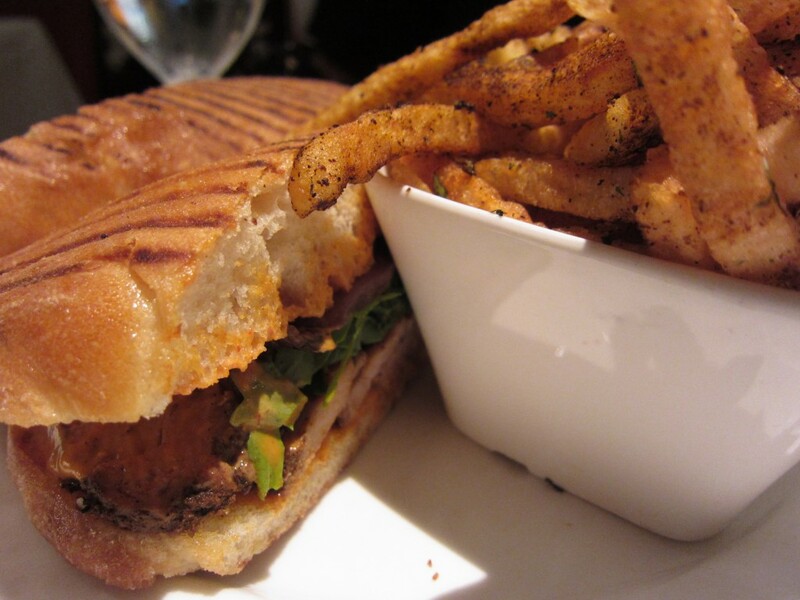 We shared the New Mexico spiced pork tenderloin sandwich. It had grilled peppers, arugula, and ancho chili mayonnaise. The sandwich was good, and the pork flavor was really clean and pleasant. Not one of the best sandwiches I had, but it did pack a lot of flavor. The south western fries were kind of soggy, and the seasonings were kind of over powering. I like sausage and pork, so we ordered the side of chorizo. It was smokey and flavorful. Interestingly, it was quite lean for chorizo, which is a good thing. The best part was the spices inside and the smoke flavor from the chilies. 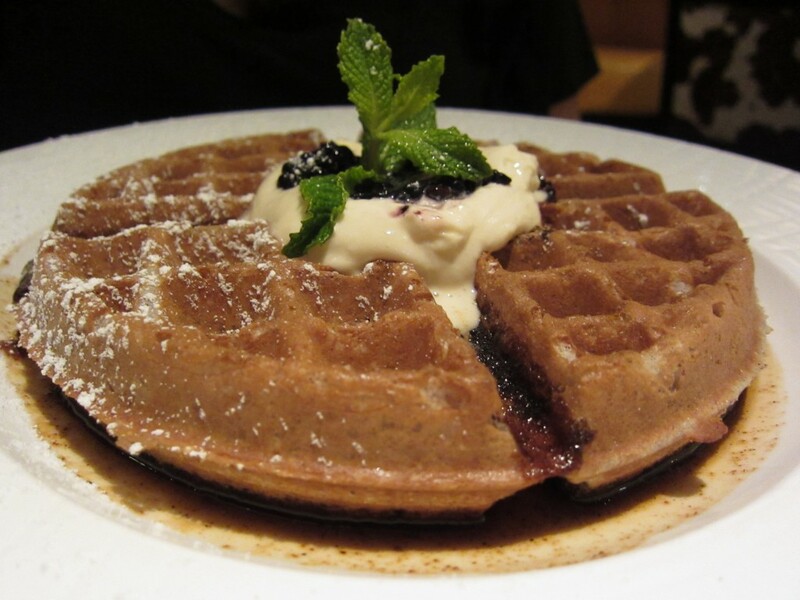 We ended our meal with the blue corn buttermilk waffle. 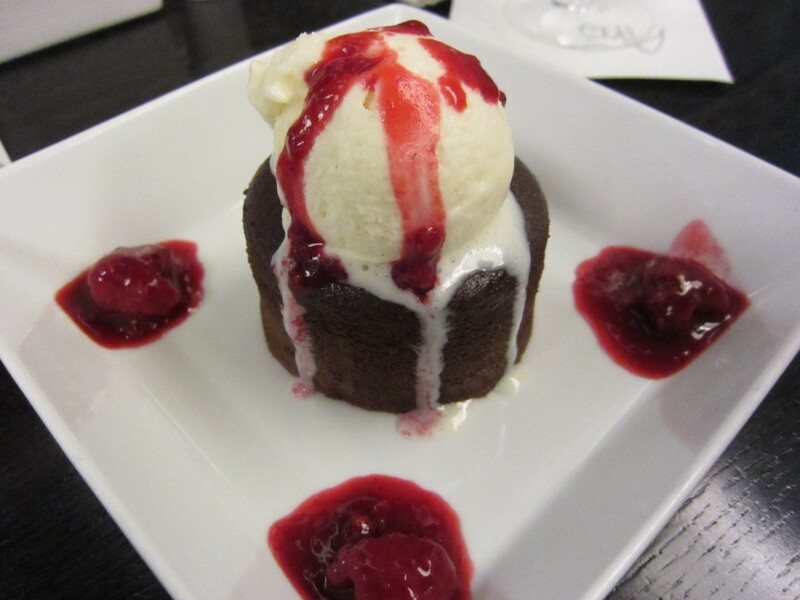 It had blackberry bourbon syrup and was topped with vanilla creme fraiche. This was probably the best waffle I have ever had. The blue corn and bourbon syrup really made the flavors so complex and interesting. It wasn’t just a simple waffle with sweet syrup, fruit, and whipped cream. 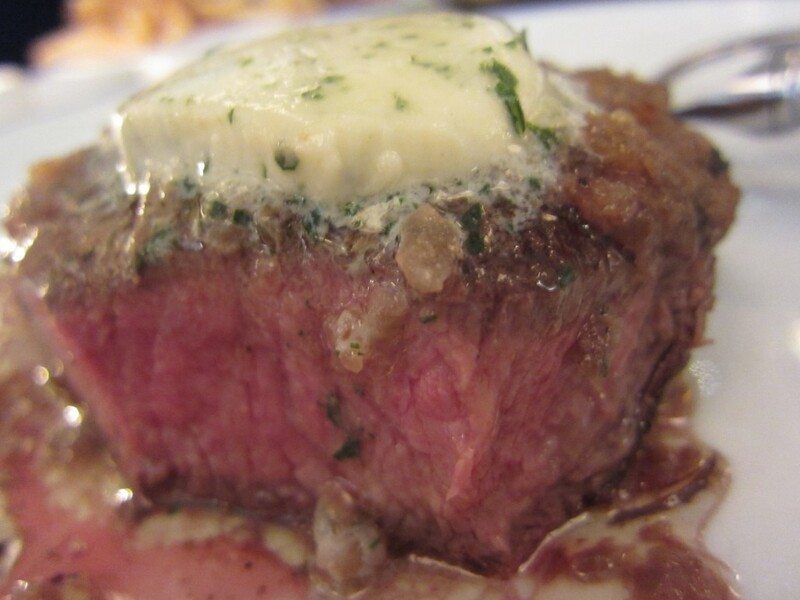 Every aspect was different, and the creme fraiche just topped everything off. This was definitely a treat for my birthday. Not only was I at Vegas, I got to eat at one of my favorite star chefs’ restaurants. This is definitely a good spot to be for lunch or dinner. It keeps you in the Vegas spirit, but also takes you away from it all. My girlfriend topped it all off and bought me one of his books — It has a bunch grilling recipes and is full of great food. 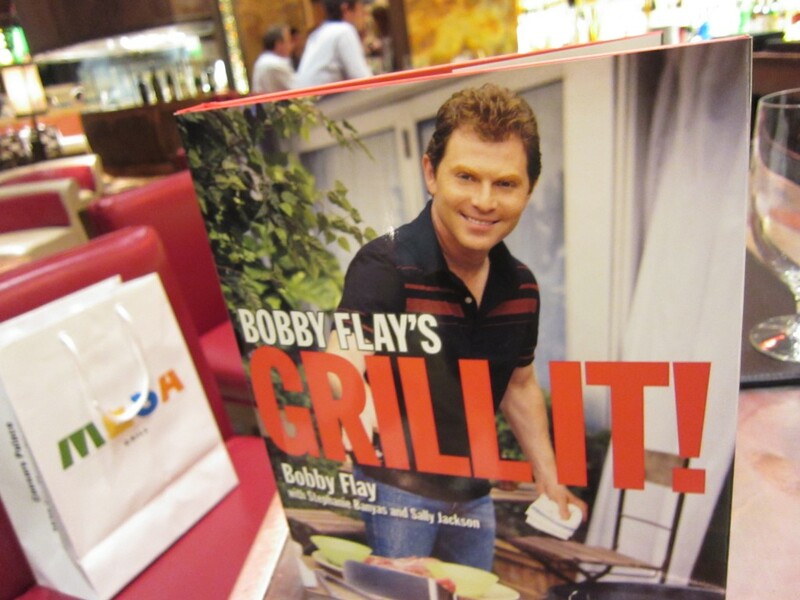 I hope to get Bobby Flay to sign it one day.